Rick Caruso sat with his wife, Tina, their four children, and the family’s pastor for Sunday dinner. It is the Caruso family’s habit to sit together for Sunday dinner, catch up with each other’s lives, and discuss family news, and their individual plans and goals. On this particular Sunday night in September of 2012, Caruso had an announcement to make. For several months, he had been mulling over the prospect of running for Los Angeles mayor and had discussed it with his wife and children. This was the second time Caruso thought about a mayoral run; the first in 2009 against Antonio Villaraigosa. Caruso seemed primed for a run for the 2013 mayoral election. His company, Caruso Affiliated, and its outdoor shopping center developments, The Grove at Farmers Market in Los Angeles, the Americana at Brand in Glendale, The Commons at Calabasas, The Promenade at Westlake and the Marina Waterside (to name a few), were revitalizing neighborhoods and creating tens of thousands of jobs, while Los Angeles as a whole continued to claw itself out of the pits of recession. Moreover, Caruso was familiar with city politics. At 25, he became the youngest commissioner for the Los Angeles Department of Water and Power. 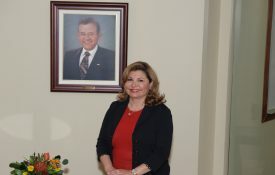 He was appointed to and then became president of the Los Angeles Board of Police Commissioners, and was a member of the Los Angeles Coliseum Commission. With his family’s support, campaign 2013 preparations were made then Caruso assembled his campaign team. Commercials were shot and edited and airtime was bought. A campaign launch date of November 9, 2012, was locked in. Caruso switched parties from Republican to Independent because of his dislike for the political warfare in which the two major parties were entrenched as well as his expectation that an Independent candidate would appeal to a greater number of the city’s Democratic voting bloc. Now, it was time to reveal his final decision. The dinner table “press conference” commenced. Caruso’s pastor was the first to broach the topic. “Are you going to run?” he asked bluntly. 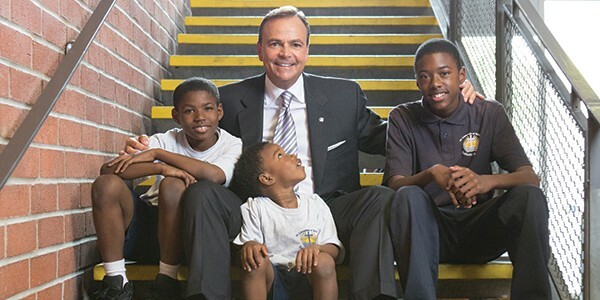 Caruso said yes and that his mayoral campaign would officially launch in three weeks. Caruso was hit with a moment of pause. Caruso’s moment of pause lasted through the night and stretched into the following week. Was he being selfless or selfish? After more soul searching, he decided against running. The family unit is a mainstay in Caruso’s life. It not only defines the political decisions he makes but also his business decisions. 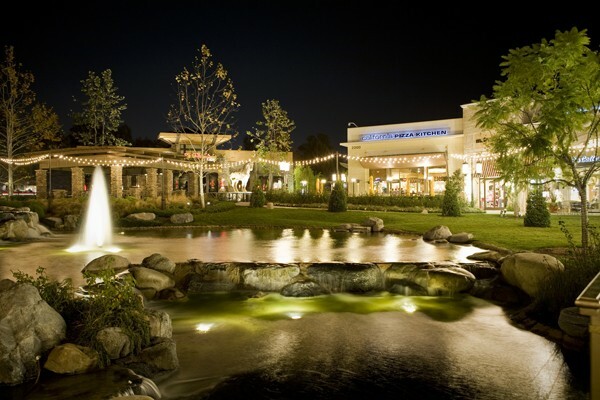 Caruso Affiliated banks on the family unit when it builds its open-air retail establishments. 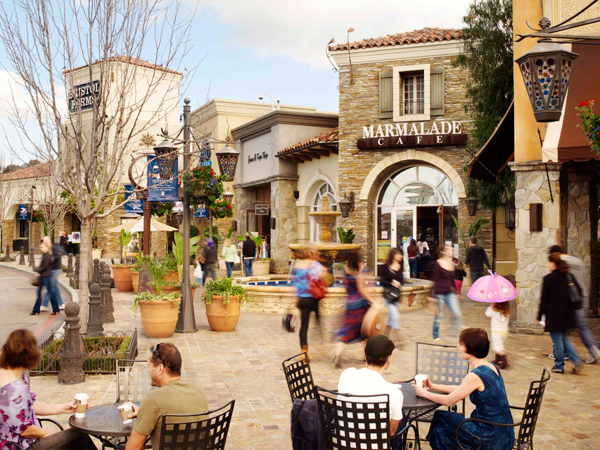 The Grove, the Americana, The Commons at Calabasas, and his other retail developments are designed to entice families, as opposed to mostly the teen consumer. They afford visitors the luxury of doing more than shopping by welcoming people to watch water fountains dance while dining on a restaurant patio, stroll with the kids, play on the manicured grass, or sit, relax, and daydream. Standing on the outdoor balcony patio of his office, “The Grove” lettering backdrop is illuminated behind Caruso. “It’s cool to envision something, build something, and then see people enjoy your work,” says Caruso. Over the past year he’s been somewhat of a sage for the open-air retail establishment, extolling its virtues at development conferences such as the National Retail Federation’s 2014 “Big Show,” where he was the keynote speaker. His message: “The Traditional Mall is Dead; Retail is Timeless.” Open-air retail is the future because it creates an experience that connects people to their surroundings, other people, and in effect it becomes a community center, he reasons. His affinity for trolleys falls in line with that mission. The Grove features a tracked trolley that creates a sense of nostalgic whimsy as passengers ride from one end of the outdoor expanse to the other. Caruso envisions a trolley system that will carry people outside The Grove, up Fairfax Avenue, down Third Street, west to the Beverly Center, and to stops in between. He insists the trolley run on a track rather than rubber wheels, which is much more expensive and cause for a great deal of street construction. And he’s willing to back his belief with his wallet. It is easy to fall lock-step behind Caruso because of his stellar record as a developer. 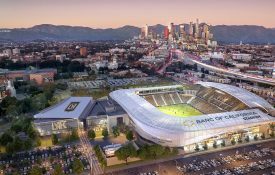 Caruso Affiliated has never failed to get a project approved on which it has embarked, except for one project in Arcadia that fell through due to the landowner filing for bankruptcy, explains Caruso. This event posed as just a speck in what has grown into today an unblemished development history of the company. Caruso Affiliated’s foray into the luxury apartment space at 8500 Burton Way – an eight-story glass tower that boasts 5-star concierge amenities – is an architectural gem that glistens on the corner of La Cienega and Burton Way. Completed in 2013, the property is full and has a sizable waiting list of prospective residents. Caruso thinks analytically and is solution driven – a trait he reinforces at every rung of the company hierarchy. The 54-year-old developer regularly faces problems because his business model is to succeed where others have failed. For instance, a mall had been planned in The Grove area for years, but developers never broke ground. The entitlement process was snarled, and the community and city officials were fighting each other. Focusing on the shopper’s experience beyond the purchase point makes Caruso Affiliated’s developments attractive to both shoppers and high-end national and boutique retailers. That Caruso Affiliated is involved with the day-to-day management of its properties is part of its allure, says Caruso. 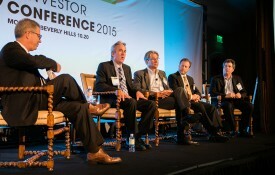 “We’re one of the few, if not the only developer that will double down on their property,” he says, emphasizing that retailers can trust that a Caruso Affiliated property will be maintained to the highest standards and as a result attract a high number of shoppers because his company is as invested in the property’s success. The Grove’s anchor store is Nordstrom, which spent between $30–$40 million on its building, Caruso estimates. “They’re not going to do that in an old, tired mall because it [an old, tired mall] is an inconsistent statement you’re making to your customer,” Caruso says. Caruso enjoys the community created when building a project nearly as much as he enjoys the end result. But when he can combine his passion for creating community with his passions for building and boating, he is near his zenith. The result of that perfect combination was Caruso’s 216-foot-mega-yacht, Invictus, built in the Delta Marine shipyard in Seattle. Built in the midst of the recession, Caruso specifically chose Delta Marine because it is an American shipyard and wanted to create jobs for American workers. “It bothered me that the yachting business had left the U.S. I wanted to bring jobs into the U.S., and we employed thousands of people for a couple years — mill workers, painters, pipefitters, electricians, and on and on,” Caruso says. The day they rolled Invictus out of its shed, Caruso threw a barbecue to thank the employees of Delta Marine and their families and handed out T-shirts with the words “Invictus: Made in America” printed on the front. 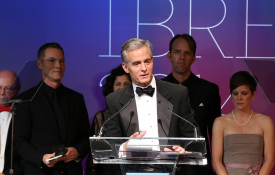 “The collective pride was palpable,” Caruso says. Invictus’ success motivated others to build their yacht in the United States. Following its completion, a Middle-Eastern group went to Delta Marine to build their yacht, Caruso says. Caruso’s interest in building and owning dates back to his childhood. His parents’ home overlooked Los Angeles, and a young Rick Caruso would look at the city and point to the buildings he wanted to buy. His father, a World War II veteran, “worked hard, some would say too hard,” to build a car sales business, eventually founding, then selling, Dollar Rent A Car. His grandfather worked as a coal miner setting dynamite in coal mines; Caruso remembers him as a gardener. 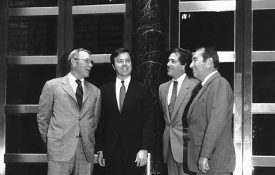 Witnessing their hard work and the familial atmosphere his father created at the workplace, he says, served as the blueprint for his leadership style with Caruso Affiliated. But first he would lose his job. A few years out of law school and working as a real estate lawyer, Caruso was blindsided when the firm shut down. Searching for solutions, he found himself asking his wife, Tina, what he should do next. His first real estate purchase was a small, “run down,” duplex in Westwood on the corner of Midvale and Massachusetts Avenues. Caruso was the gardener, maintenance man, painter, and leasing agent. 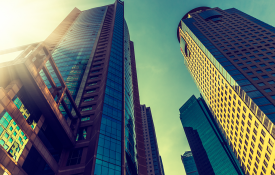 He learned the value of his property increased when he maintained its infrastructure and beauty, enabling him to justify rent that was higher than nearby, comparable properties. Caruso held on to that property until 2012 and reluctantly sold after executives at Caruso Affiliated detailed the time being spent maintaining it. 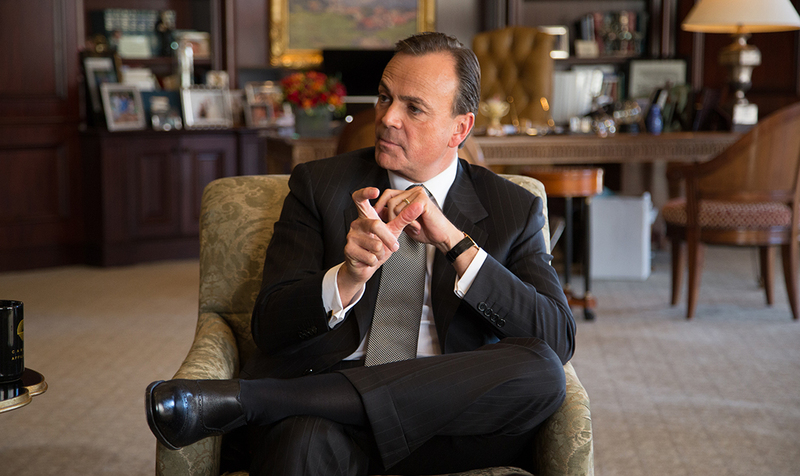 “That was the only [property] I ever sold,” Caruso says. Being born and raised in Los Angeles, Caruso involves himself with all parts of the city, including its less-fortunate areas. His inspiration for philanthropy comes from his Catholic faith and respect for Pope Francis. Caruso’s children volunteer at St. Lawrence School in South Los Angeles and on Skid Row and the family contributes to and financially supports Para Los Niños, a nonprofit organization that provides educational opportunities and social well-being for children in LA’s most impoverished areas. He sees opportunity for growth throughout Los Angeles but advises city leaders to focus on individual neighborhoods, celebrating and understanding what makes them and their issues unique. Caruso, as an Angeleno native with more than $1 billion in assets invested in the city, has both personal and professional reasons to challenge Los Angeles’ leaders to be better and to solve the problems he sees. Being handpicked to sculpt a billionaire’s children is far from the norm, but for French sculptor Delesprie, that’s what happened. Delesprie was commissioned to sculpt Rick Caruso’s children, who can be found in bronze form frolicking on the grounds of Caruso Affiliated’s many properties. What started as a brother and sister selling lemonade under a shade tree on a grassy knoll by a lazy pond has blossomed into a tremendous working relationship. Caruso and Delesprie, both masters of their crafts, have recognized the unique and unquestioned talent in one another and have opted to stay together, for the kids. As a result, the Caruso children, bronzed exquisitely, will live on across the region as timeless reminders of the importance of family. Some of her most famous works are seen by millions of people year after year. Whether visiting the Gene Autry Museum, catching a game at Angel Stadium, or visiting any of Rick Caruso’s properties, you’re bound to walk past a Delesprie work. The meticulous details she captures in a 30-inch tall piece can take up to 1,200 hours to create – the truest testament to Delesprie’s painstaking dedication to her craft.